At the second edition of Vadodara Internationl Half-Marathon, India 30,000 runners will be tracked and traced with the support of RFID technology, reports The Times of India. Marathon coordinators said that the RFID technology would help to avoid any anomalies. “If any of the runners jumps his track, he will be disqualified from the race,” said Amit Bhatnagar, marathon director. 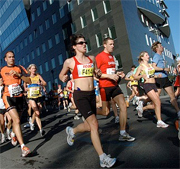 RFID has made tracking marathon race results a much easier and more accurate procedure. In the past, runners had to rely on human beings working the races to track what time each runner left and finished, however, the RFID tags make that operation unnecessary as now each runner has an exact readout of when they crossed each line.